Why worry about surface discoloration and blue stain when you can protect cost-effectively with Sansin Timber-Tec. Timber-Tec protects from UV degradation and repels water (helping your wood dry) but it will also mitigate wood discoloration during the construction process. Timber-Tec can be applied to green as well as seasoned timber, improving dimensional stability and allowing wood to adjust gradually to moisture levels in the environment. Timber-Tec C-20 is a concentrated clear penetrating wood treatment for logs and timbers that protects from staining and surface discoloration. Ideal for normal construction times of 4-8 weeks. Timber-Tec M-30 is a concentrated milky penetrating wood treatment for logs and timbers that protects against UV degradation and from staining and surface discoloration. Ideal for longer construction times in areas with high UV exposure. 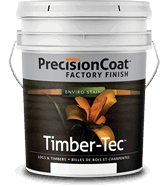 Timber-Tec T-40 is a ready-to-use milky penetrating wood treatment for logs and timbers that is highly water repellent and protects against staining and surface discoloration. Ideal for normal to long construction times in high-moisture environments.